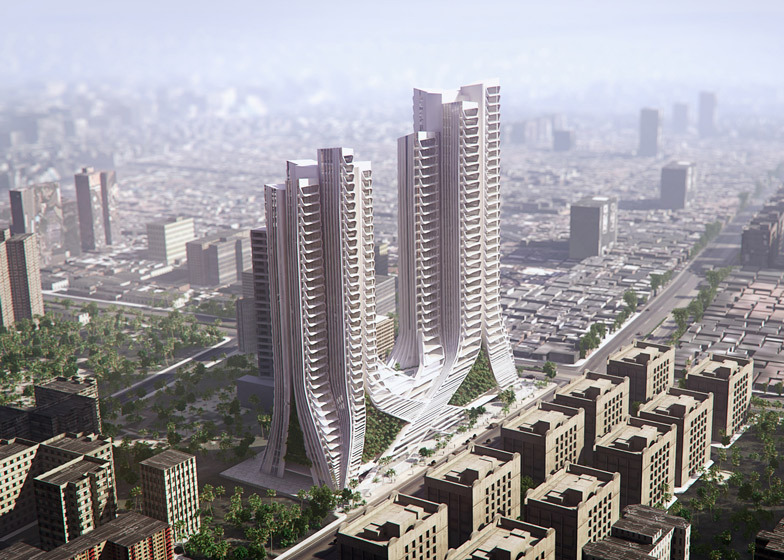 News: construction has started in Mumbai, India, on a pair of 38-storey towers with overlapping bases that make reference to the knotted structures of mangrove stalks, according to Danish firm 3XN. Named Grove Towers, the two skyscrapers will extend to a height of 136 metres, creating 273 apartments, ground-level shops and over 2,500 square-metres of elevated gardens. 3XN said that the design was based on the vine-like roots of mangroves – saltwater-tolerant trees that are common in India – imagining buildings that "seemingly braid together at the base". An engineered facade will help to prevent solar gain and allow the building to use natural ventilation. 3XN also expects that the elevated garden will help reduce carbon dioxide levels in the surrounding air. "With this design for Grove Towers, we wanted to create something special," said 3XN principal Kim Herforth Nielsen. "Each time I visit, I am overwhelmed at how much I see the strength of community in all aspects of Indian life. I want this to be a vertical community that brings people together, and becomes a setting for growth and life." Before construction, client Ornate Spaces hosted a traditional Bhumi Puja ceremony asking mother nature for permission to build on the land, and to bless the project. "3XN is one of the elite few who has worked innovatively and untiringly to bring to fruition an edifice that will redefine the Mumbai skyline and which will be a tribute to this indomitable city and its people," said Vijay Machindar, the company's managing director. Grove Towers are scheduled for completion in 2017.